We ship international from San Diego California and offer the best shipping rates in the industry. All advertised shipping rates to the destinations listed above are for shipping one gas tank and 2 fenders only. If we can fit in some small parts such as side covers into the same boxes we will not charge extra. These advertised super low rates do not apply to any of our items sold on eBay or any of our parts and services that are on sale. For the shipping cost to any other country, please contact us for a quote. We ship all parts securely packed inside heavy duty foam injected boxes, similar to how electronic equipments are shipped. All parts are insured for the full amount of their replacement value & shipped via UPS or USPS. A- Always insure your parts for their full replacement value. B- Position your parts at least 2 inches away from all box walls. 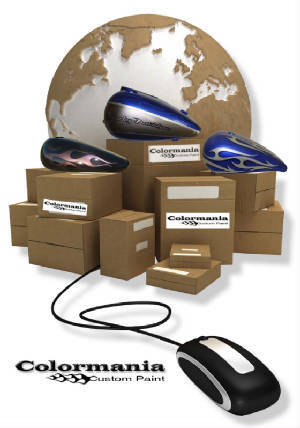 C- Never use used or old boxes, since they may loose their shape and cause damage to the parts. D- If you are placing several metal parts inside the same box, make sure they can not scratch and damage each other. E- Drain the gas tank completely & let the remaining gasoline inside the tank evaporate prior to packing. F- Remove all mouldings, gas caps, tail light and other hardware prior to shipping.